The French have an amazing propensity for producing talented young keyboard players. A major contributory factors must be the numerous church organist posts that provide such an excellent training ground. This is coupled with a commendable willingness on the part of the French to invest in new church organs of outstanding quality and specification; music education is of little use without instruments to play. 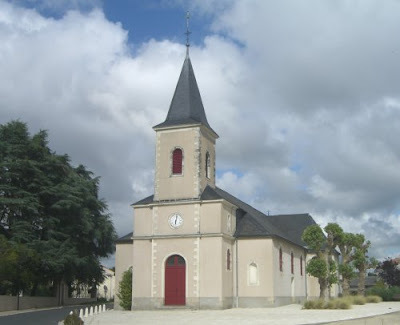 Last summer we were lucky to attend two recitals by the, then, 23 year old Benjamin Alard in the exquisite church of Saint-Aignan-de-Grand-Lieu outside Nantes in western France. The church, which dates from the 16th to 18th century, is seen in my three photos below. 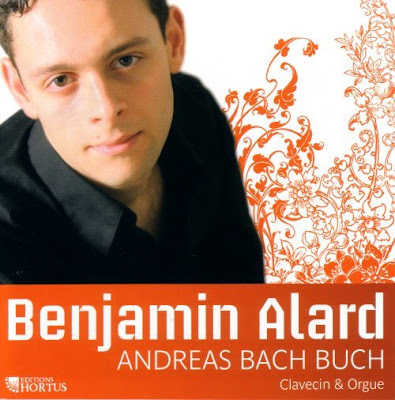 I first came across Benjamin Alard when I bought the CD seen above in FNAC in Avignon in 2007. This disc, made for the maveric French independent label Editions Hortus, is of music from the notebook compiled by J.S. Bach's elder brother Johann Christoph. The title Andreas Bach Book comes from the name of Johann Christoph's son, which is written on the cover of the notebook. A varied selection of composers feature on the disc. The mix of Buxtehude, JS Bach, Johann Caspar Ferdinand Fischer, Christian Ritter, Carlo Francesco Pollarolo, Marin Marais and Johann Adam Reincken avoids the repetition that can make discs by single composers of this period difficult to listen to at one sitting. Lovely sound captured in 2005 by Roger Lenoir in the church of Saint-Étienne-de-Baïgorry using the new organ by Rémy Mahler and a 2001 clavichord by Philippe Humeau. 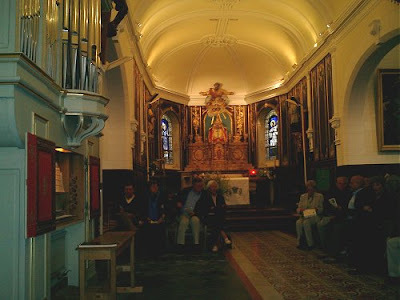 The recitals of music by the Bach family we attended in Saint-Aignan-de-Grand-Lieu spanned the organ and harpsichord in one marathon, but highly satisfying, evening. The first recital on the harpsichord was scheduled to start at 7.00pm (except, being France, it didn't) and ended with JS Bach's Partita No 4 BWV 828. There was then an hour's interval, and the organ recital started at 9.00pm. 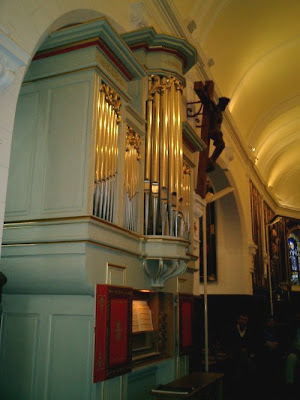 The new organ by Charles Beaurain, unusually located in the centre of the church, can be seen in two of my photos. Benjamin Alard's marathon recital ended just before 11.00pm with the mighty Prelude in E-flat major (St. Anne) BWV 552 which I have also been privileged to hear in Bach's own Thomaskirche in Leipzig. Hearing that Prelude played by a great organist on a fine instrument truly makes the world seem a better place. But Benjamin Alard is not just a great organist. He also has a very cool head on his young shoulders. There was no page turner for the harpsichord recital. (Why do harpsichordists invariably turn their own pages? The size of the keyboard? Or are they just naturally modest?) During the sonata BWV 964 the next page of the loose-leaf score fell to the floor as Alard turned the page. He calmly continued to play from memory while manoeuvering the errant page with his foot to a position where he could read it, and then kept playing Bach's masterpiece from the page on the floor. We sat on the edge our seats wondering how he was going to turn the page over with his shoe. But it was not to be. A quick-thinking member of the audience in the front row leaped to his feet and replaced the page on the music stand just in time. Benjamin Alard also learns from his errors. For the following organ recital he had a page turner, who looked very much like his younger brother. There must be something in the water in France. 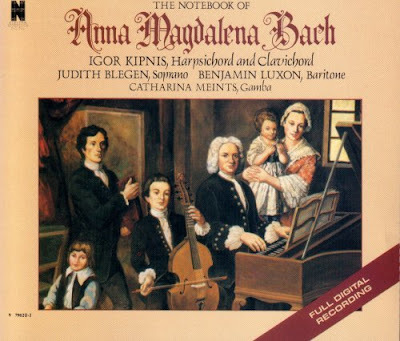 * An article about Bach notebooks really must mention the Anna Magdalena Bach notebook. For my money this is a perfect evening's listening. Many times I have played the 2 CDs straight through at one sitting. No problems with repetition here. There are several versions available. My choice is the splendid Nonesuch recording with Igor Kipnis at the harpsichord seen below. An absolute essential for any CD collection, despite the minute type in the notes which was lazily reduced from the LP version by Warner without resetting. But do also try the uncharted territory of the Andreas Bach book. More from the maverick Editions Hortus here, here and here. Great instruments are wonderful, but don't forget early instruction. The system of both municipal and regional conservatories, where instruction is primordial makes a huge difference. In other countries, playing the harpsichord and organ is often seen as a skill acquired after mastery of the piano, whereas in France, these 2 instruments are seen as primary instruments. For the harpsichord in particular, there are some wonderful teachers who have made pedagogy (rather than performance) the focus of their professional careers (Francoise Marmin, Laure Morabito e.g.). See, for example: (in French) http://www.clavecin-en-france.org/spip.php?article3. I have seen such questions raised in piano ped. discussions, but to the best of my understanding, the harpsichord world, outside of France, does not choose to make pedagogy for youth a priority.